What are the must implement On-Page SEO techniques? Well, as for introduction… Although I want to do it very badly, you know, flaunting my writing skillls, some of the On-Page SEO techniques wouldn’t allow me to do so. Want to know what they are? Of Course, you will have to read further to find out. But before you get to our checklist of On-Page SEO techniques that you have come for, let us take a look at this definition below. You know, just to make sure that you have the basics of On-Page and Off-page SEO right. SEO (Search Engine Optimization) refers to the act of optimizing websites to make them rank higher in search results. Optimization, in general, is of two kinds: on-page and off-page. On-Page optimization happens within the sites. On the other hand, the off-page optimization occurs from outside. 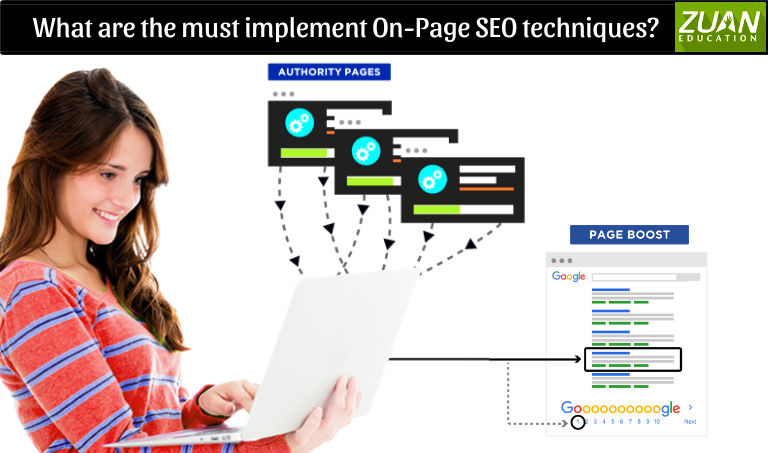 On-Page SEO can be, for instance, in the form of meta tags, keyword placement, HTML code, and keyword density. And examples of Off-page SEO are social media marketing and link building. No matter what, content always secures the top position where ranking is concerned. So, create a piece of content that is useful from the readers’ end. You cannot hope for good results if your content is not worthy of their time. Got a good content worthy of readers’ attention? Now, do keyword research and throw in some decent number of target keywords to your content. Every keyword that you add counts. However, make sure that they are relevant to your content. And at the same time, see to it that you avoid keyword stuffing. Including your focus keyphrase in your introductory paragraph and adding significant keywords in the first hundred words are some of the techniques you could follow. So, as I said in the introduction, Google doesn’t really enjoy the flamboyant styles. Forget all about those fancy titles and heading suggestions you have in your mind. Be as direct as you can with your title. Make sure to include your target keyword or focus key-phrase in your title and at least one of your subheadings.It is even better if your title begins with the focus key-phrase. Place your page titles in its respective title tags. Add H1 tag for your title; use H2 tags and the others for the sub-headings. Don’t underestimate the role of title tags in SEO. Go ahead and learn a few hacks. Title tags can do magic on your click-through rates. Images and videos are definitely more attractive than plain text. Relevant and engaging multimedia will let the readers spend more time on your page and at the same reduces bounce-rate. Yes, multimedia adds splendor to your page. But at the same, they also add to the loading time when they are not optimized properly. A page that takes longer to load will end up getting a bounce back. Optimize the chosen media by compressing and or resizing. Too many plugins and extensions can also bring your speed down. So go ahead and remove the useless ones now. You can also refer to Google’s ‘PageSpeed Rules and Recommendations’ to get an insight. Add relevant internal links to your content. Doing this will help your website to acquire visibility and traffic. And at the same time, adding links will make Google take a note of your page. Without a link, Google is more likely to ignore your page. Just make sure that the links lead the readers to the page that they are after. Causing disappointments to readers through some sly or unfair actions can cause dire consequences. External links (Outbound links) on the other hand can bring credibility to your sites. Of course, only web links of the higher standard and relevant subject can do that. Outbound links can also enable Google to understand your content better. This On-page SEO technique helps your page reach the target audience quite easily. If your web page is not mobile friendly already, it is high time that you become one. Google is kicking out those mobile unfriendly pages now. Of course, who can blame it? Pocket Internet is on a steady rise, and Google is merely trying to be user-friendly. To get your pages rank higher in the google searches, you have to think from the perspective of a user. Knowing what they need and understanding what Google believes the users need, can let you attain your goal quite easily. Moreover, to Google and the other search engines, the user experience is the priority. So work on those lines. These 8 On-Page SEO techniques can do more than merely get you started. Apart from the On-Page SEO techniques mentioned above, you can also work on your SEO by giving your page a good SEO title and a good meta description. Learning how to do an SEO Audit can come handy as it can boost your ranking on online searches. You can also check out our SEO Course Page to learn more about SEO and the job prospects if you are considering a career in SEO. Hope you found this article useful. The Comments section below is open for feedback, suggestions, clarifications, and discussions. Feel free to voice out your thoughts. So Happy SEOing guys! !